Image caption Firefighters are tackling a major blaze at a factory in Silvertown, east London. Twenty firefighters are tackling a major blaze at an industrial processing plant in Silvertown, east London. About half of the two-storey factory in Knights Road - which is owned by John Knight Ltd - is on fire. 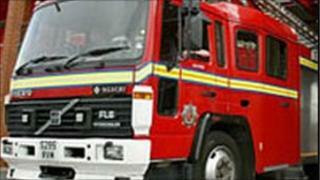 Firefighters were called to the site, which is believed to be used for processing bone meal, at 14:48 GMT. No casualties have been reported, but six fire engines remain at the scene while the fire is brought under control.